Methodists Sell Out to the Mother of Harlots! Be Ye Not Unequally Yoked! Seoul, Jul. 25, 2006 (CNA) - In a historic step on the road toward Christian unity, the World Methodist Conference adopted the Catholic-Lutheran joint declaration on justification July 23. The declaration had been previously approved by the Vatican and the Lutheran World Federation in 1999. The agreement on justification, which explains how people are made just in the eyes of God and saved by Jesus Christ, "provides a basis for a more profound common witness before the world," the cardinal reportedly said at the signing. Two representatives from each of the three church bodies signed the agreement. The agreement between the Methodists, Lutherans, and Catholics is evil. It's called "ecumenism" and God hates it! Ecumenicalism is the doctrine of Balaam (Revelation 2:14). Balaam's heresy caused God's people to yoke together with the godless Moabites (Numbers 25:1). As a result, 24,000 Israelites were slain. Ecumenism is the exact opposite of Biblical separation, and they are diametrically opposed to each other. As believers, we are commanded in Ephesians 5:11 to "refute" (Greek, elencho, which means "to EXPOSE") all works of darkness, and not fellowship with them. The Methodists are sinfully fellowshipping with the Devil's gang. Catholicism is straight out of the pits of Hell. Methodists Have Defiled the Temple of God! With all the bowing to statues (Exodus 20:4-5), praying the Rosary of vain repetitions (Matthew 6:7), calling the priest "Father" (Matthew 23:9), being forbidden to eat any meat but fish on Fridays (1st Timothy 4:1-3), confessing sins to the priest (1st Timothy 2:5), and trusting in the demonic seven-sacraments to save them (Ephesians 2:8-9)--why would any Christian bid the monstrous Catholic Church God's blessings by signing an agreement with them? Again, what agreement hath the temple of God with idols? Carefully read 1st Corinthians 3:17, "If any man defile the temple of God, him shall God destroy; for the temple of God is holy, which temple ye are." The temple of God is each and every born again believer. So then agreement do born again believers have with the idolatrous Catholic religion? NONE!!! Now either the Methodists aren't truly believers, or else they are sinfully yoking together with unbelievers. Satan loves it when Christians unite with the sinful world. Thus, Satan loves Christian rock music. Satan loves feminist theology. Satan loves openly homosexual ministers. Satan loves Christianity Today for endorsing Harry Potter's witchcraft. Satan loves Jack Van Impe for saying that Pope John Paul II was one of the greatest men of the 20th century. No, Pope John Paul II was the greatest fraud and liar of the 20th century, and he is burning in Hell fire this moment! But you say, that's not a very nice thing to say. Maybe not, but it is the TRUTH, and I don't want you to go to Hell with him. I plead with you to follow the Word of God alone, and not some damnable religion like Catholicism. 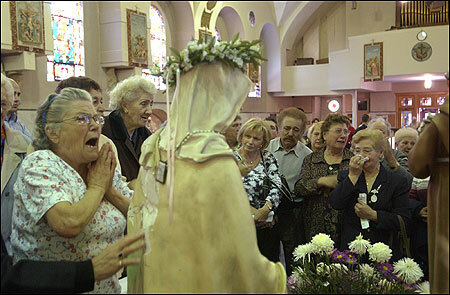 The Mary of Catholicism is NOT the Mary presented to us in the Bible. The Catholics have created a monster, which Revelation calls, "The Great Mother of Harlots." Jesus' mother was a sinner (Romans 3:23), and she certainly did NOT remain a virgin (Matthew 13:55,56), and she cannot intercede for us in Heaven (1st Timothy 2:5). So where does the Vatican find all these juicy lies? They are manmade doctrines NOT found in God's Word. Who are you going to trust, men or God? ... "It is better to trust in the LORD than to put confidence in man." Apostate World Council of Churches Considers Catholics "Christians"
What apostasy!!! "Christian divisions"? Let me state adamantly friend that Catholicism is NOT Christian! We read in 2nd Corinthians 11:13-14, "For such are false apostles, deceitful workers, transforming themselves into the apostles of Christ. And no marvel; for Satan himself is transformed into an angel of light." God warns us in His Word that Satan is a master deceiver, a ravening wolf, who always comes to us in sheep's clothing. Matthew 7:14 warns, "Beware of false prophets, which come to you in sheep's clothing, but inwardly they are ravening wolves." Satan is a spirit, and the world is saturated with his evil spirit (2nd Corinthians 4:4; 1st John 5:19). The Catholic Church is of the Devil--having religion without truth, and churchianity without Christianity. 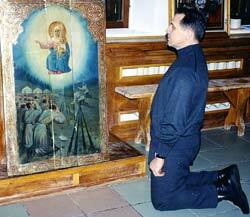 They bow to idols; yet hypocritically claim they are not worshipping them. 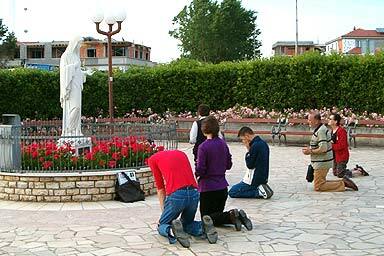 They say 53 "Hail Mary's" in each standard Rosary; yet deny praying in vain repetitions. They call the priest "Father," when Matthew 23:9 strictly forbids it. Catholicism is a prisonhouse of religion!!! Oh the deception and the blindness upon their eyes because of the hardness of their hearts! The division between Christians and Catholics is a division between Light and darkness, between Heaven and Hell, between saved and unsaved, between believer and unbeliever. It is NOT a "Christian division" because Catholicism is of the Devil. Every unsaved Jehovah's Witness and Mormon believe the basic Gospel; but they ADD works to faith, as do the Catholics; thus, corrupting the simple Gospel. We are warned in 2nd Corinthians 11:3-4, "But I fear, lest by any means, as the serpent beguiled Eve through his subtilty, so your minds should be corrupted from the simplicity that is in Christ. For if he that cometh preacheth another Jesus, whom we have not preached, or if ye receive another spirit, which ye have not received, or another gospel, which ye have not accepted, ye might well bear with him." 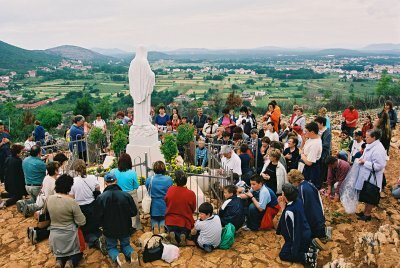 Catholicism preaches ANOTHER GOSPEL, which is a sure road to Hell paved with good intentions. Just because Catholics agree with justification by faith means NOTHING when they ADD all their self-righteous works to it. Listen to what God says about man's self-righteousness in Isaiah 64:6, "But we are all as an unclean thing, and all our righteousnesses are as filthy rags..." You don't need works to be saved! Shame on any professed "Christians" who dare fellowship and come to an agreement with the damned Catholic Church. "And what agreement hath the temple of God with idols?" (2nd Corinthians 6:16). Ecumenism is a two-headed monster! God NEVER told us in the Bible to compromise or dip-our-sails to appease the unbelieving world. No sir! What the Methodist and Lutheran Churches have done by signing an agreement with the Catholic Religion has identified them clearly as the "harlots" of "The Mother of Harlots." Revelation 17:5reads, "And upon her forehead was a name written, MYSTERY, BABYLON THE GREAT, THE MOTHER OF HARLOTS AND ABOMINATIONS OF THE EARTH." Lutheranism is nothing more than diet Catholicism. Martin Luther was a heretic and went to Hell. Luther clearly believed and taught Baptismal Regeneration. Martin Luther worshipped Mary. God NEVER told us to compromise our beliefs, standards, or convictions to win the lost. The World Council of Churches is as apostate as Satan himself. To attempt to unite, or even find a common denominator, between Satanic false religion and genuine Christianity is like trying to unite a hungry wolf with a defenseless lamb because they're both animals. Many false religions believe the basic Gospel; but they corrupt it by adding to it, or by redefining truth into lies. Even Mr. Charismatic ecumenicalism himself, Benny Hinn, presents the basic Gospel on his website. Yet, he publickly endorsed Catholicism's Our Lady of Fatima (the Queen of Heaven) on the Larry King Live show. Hinn states that he grew up Catholic, and by all indications is still Catholic. Hinn appears to be a little bit of everything these days ... whatever it takes to keep the money flowing in. His Satanic ministry takes in over $100,000,000 a year. People are so gullible. Hinn is to the Charismatic Movement what Billy Graham has been to the Evangelical Movement--both preaching the ecumenical doctrine of Balaam! The Devil is working relentlessly in these last days to blur the lines between the Truth of God's Word and false religion's lies. The hidden agenda of the Ecumenical Movement is a one-world religion, which will ultimately have people worshipping the Beast when he arrives. The average person is walking in total spiritual darkness nowadays.